I have noticed that my recent savoury recipe posts – Cheese and Vegetable Lunchbox Muffins and 10 Wrap Filling Ideas for School Lunches have been super popular. So I have been working on some savoury recipes for the lunchbox. Preferably an option that is protein packed and that we can sneak some extra veg into. And these Quick and Easy Lunchbox Quiches hit the mark. The first time I served my Quick and Easy Lunchbox Quiches to Mr 6 in his lunchbox they came home uneaten. I had not served quiche in a while so I sort of was expecting it. But it was bacon and egg flavoured so I thought he might at least try it because he has been loving bacon recently. When I asked him if he did not feel like trying the bacon and egg lunchbox quiche he turned to me and said ‘oh was there bacon in that?’ Cue internal scream. But I do know that Mr 6 would eventually try them so it is just a matter of try and try again. 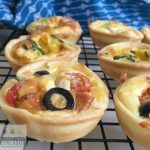 I think one of the best things about these Quick and Easy Lunchbox Quiches is that the flavours are adaptable. You can tailor them to what your child may like. So today I thought we would have them for lunch again. I made another two batches, one for our lunch and one for the freezer. Today we tried creamed corn and chives, pizza flavour (salami, tomato and olives) and tomato and spring onions. They were a hit and Mr 6 even ate a pizza flavoured one – go Mum! The case is also adaptable. Even though I used pastry you could also substitute the pastry for wraps or bread. These are just so versatile. 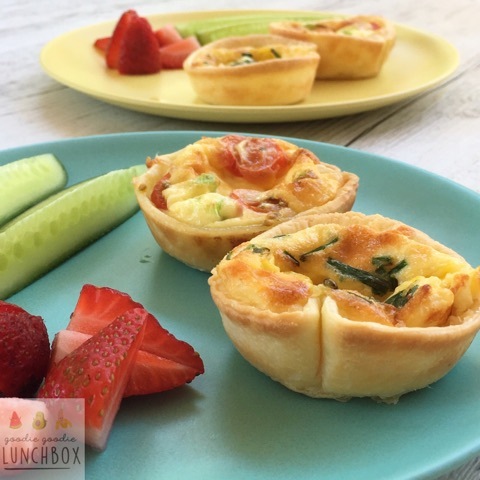 So now let me share my recipe for Quick and Easy Lunchbox Quiches with you! 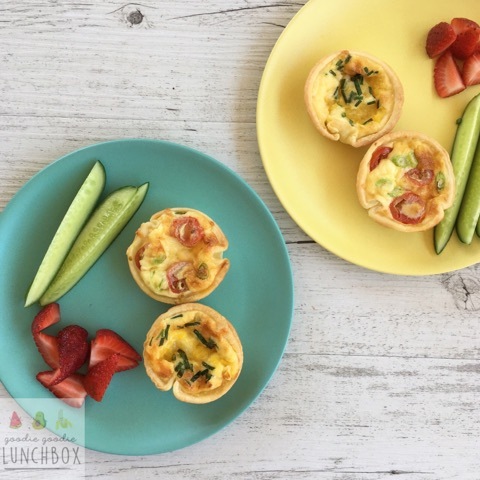 These Quick and Easy Lunchbox Quiches are a perfect alternative to a sandwich. 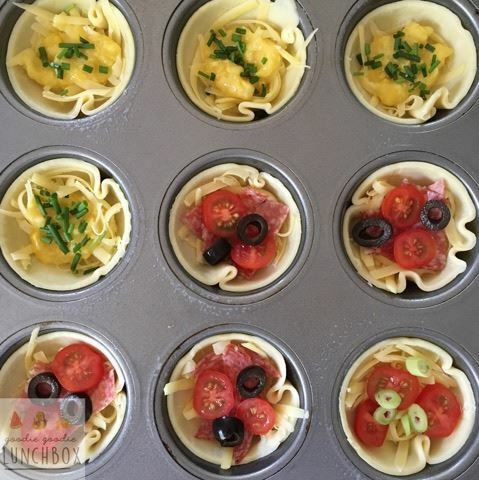 Completely adaptable your children will love these quiches! These quiches are freezer friendly. Take them out of the freezer the night before and defrost in the fridge before eating. Consume within two months. I hope you enjoy this recipe – I am sure it will be a lunchbox hit for you! 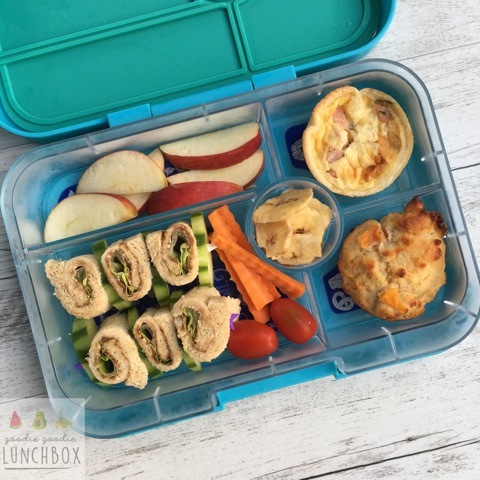 If you are ever looking for lunchbox inspiration be sure to check out my School Lunch Guide and head on over to my instagram account and follow along. Also if you head on over before the 16th of February you can enter into the international giveaway for The Lunch Punch celebrating the release of three new fun lunch sets! Woo hoo! So what are you waiting for?! This is a stunning idea! Just what I was looking for !! I’m always after lunches we can grab out of the freezer and eat cold!